Is there a better alternative to Get Organized? Is Get Organized really the best app in Miscellaneous category? Will Get Organized work good on macOS 10.13.4? Get Organized is a simple and efficient academic planner that helps you keep your course schedule and grades organized. Specify assignment details, keep track of up-and-coming and overdue schoolwork, monitor grades, and more. 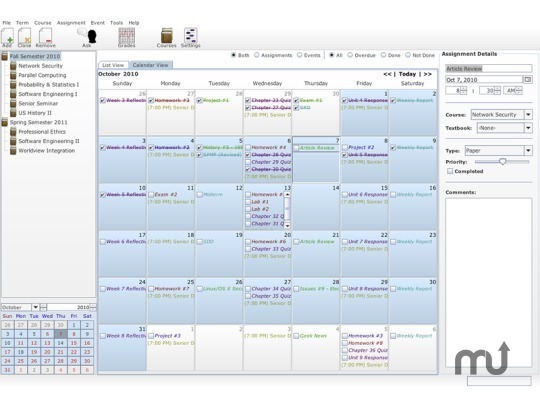 View your schedule as a collective list or in a familiar calendar format. Get Organized is a free, digital planner that eliminates the hassle and cost of a physical planner. See the list of Key Features at GetOrganizedApp.com that will help the punctual to stay on top of their schedule and the procrastinator to stay on track. If you use Get Organized, please consider donating--developing software costs money (and so does coffee). Get Organized has been replaced with Helium. Switch today!